I don't think there is a person out there who has not heard about the great flood and how Noah built a big boat(ark). Everyone who believes in this story wonders about how big the ark was, how the animals lived and so on. We all have our questions about the animals, the ark and the flood. A lot of people wonder about what happened to the big boat. The bible tells us it landed on a mountain and for most people like me, that satisfies me. Then there are other people who believe the ark is still up on the mountain and want to discover it. I was able to preview the movie Finding Noah last night and I was just amazed at how a group of people went on a journey to find Noah's ark. The risks these men had to take was incredible. They had to endure miles of climbing through ice and snow. These men were tough as they face freezing temperatures. It leads me to the question that I have always had. Does God want us to discover the ark? Is the ark meant for us to find? I think of the tower of Babel and how god scattered the people for wanting to build a tower to reach heaven. For over 2,000 years, man has been searching for the final resting place of Noah's Ark. 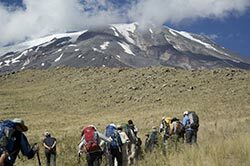 Though there have been many attempts, few have been able to fully explore the one place specifically noted in the Bible: Mount Ararat. Located in Eastern Turkey, Agri Dagh or "The Painful Mountain" is the tallest mountain in the region and lies in the very center of a centuries old, geo-politically unstable hot spot. 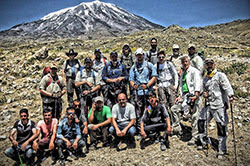 With constant threats of deadly rock slides, hidden crevasses, and glacial ice falls, the Kurdish Rebel held mountain poses great risk to any explorer, let alone those performing a thorough scientific investigation. Join director/producer Brent Baum and the FINDING NOAH film crew as they follow an expedition of intrepid explorers on a perilous trek up to Mt. Ararat's desolate summit. There, using state of the art technology and real-time satellite imagery, this team of archeologists, scientists and professional mountaineers will begin a grid work of exploration unlike any before, hoping to finally resolve the age-old question: did Noah and his Ark actually exist? Shot in never-before filmed locations in the harshest of conditions, this unprecedented feature-length documentary shows just how far men are willing to go to discover the truth. 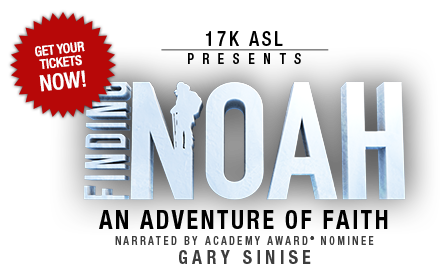 Narrated by Academy Award nominee Gary Sinise, FINDING NOAH is more than a quest for answers, it is a testament of the human spirit, where belief and the need for exploration transcend risk and limitation. Watch the official trailer and other videos. If you want answers about Noah's ark and if they found the boat, well you have to watch the movie. I am not giving away any information. This movie is only out for one night--October 8th, 2015 so get your tickets before they sell out. Sounds like a great film!! There are so many that try and find it and it's just interesting to hear all of their journeys!! Can't wait to see it! This looks awesome! The story of Noah is so powerful and I know this one will be as well. Can't wait. thanks for sharing! I can't wait to see this -- the Noah Story has always fascinated me! My husband really wants to see this movie and I can see why. Noah's story is very interesting. Last week we got a lot of rain. I said, I saw Noah outside loading up the animals. I got the strangest looks. Like in their minds they were thinking, who is Noah?